Authorities placed an Illinois police officer on desk duty Monday night after video surfaced of him standing idly by as a man harassed a woman wearing a shirt with the Puerto Rican flag. The footage, captured on Facebook Live last month, has gone viral, and it even drew the attention of Puerto Rico's governor. The June 14 video, which runs 36 minutes long, shows an irate man approaching Mia Irizarry as she waited for her family at a picnic area in the Forest Preserves of Cook County to celebrate her 24th birthday. Among other things, he tells Irizarry to not wear a T-shirt celebrating Puerto Rico if she's an American citizen -- despite the territory being part of the U.S.
"You should not be wearing that in the United States of America," he said. "Are you a citizen?" "Yes I am," Irizarry replied. "Then you should not be wearing that. You should be wearing United States of America flag," he said. 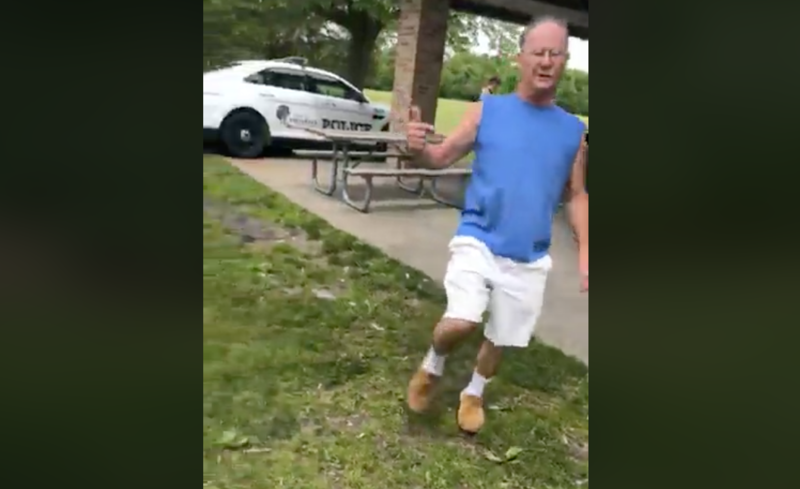 An officer from the Forest Preserves arrived, but video shows he didn't intervene, even as the man invaded Irizarry's personal space and continued to harangue her. Irizarry can be overheard saying on the video that's she's "uncomfortable" several times, but the officer does nothing. "As you can see, the police are not even -- he's not even grabbing him," Irizarry said. "Officer, I'm renting -- I paid for a permit for this area, I do not feel comfortable with him here, is there anything you can do?" she said. Eventually, Irizarry's brother shows up and tells the man to back off. As the video continues, more park officers arrive at the scene and finally sit the man down and ask for his ID. A female officer can be heard saying that he's intoxicated, to which he replies, "Well, that's your judgment." She warns him that he could be arrested "for not being compliant." "You don't come here harassing people," the officer says. "People have just as much right to be here as you do, and when you're drunk you don't belong here." Irizarry is seen filing a formal complaint and says that the initial responding officer did "absolutely zero." CBS News correspondent David Begnaud reports the officer's name is Patrick Conner. The Forest Preserves, which oversee 70,000 acres in Cook County, released a statement on the incident, saying "no one should feel unsafe while visiting our preserves." "After the June 14 incident, we immediately launched an investigation pursuant to our personnel policies into the response of our officer. The investigation is ongoing and the officer involved has been assigned to desk duty pending the outcome." The agency adds, "The intoxicated individual involved in the incident was arrested and charged with assault and disorderly conduct." Puerto Rico Governor Ricardo Rossello saw the video and also condemned it. "I am appalled, shocked & disturbed by the officer's behavior," Rossello tweeted. "The United States of America is a nation that was built and thrives on diversity. We cannot allow those who do not understand America's greatness to terrorize people because of their background. This is not the America we all believe in."